Taco Bell’s Churro Donut is Only in Kansas City. We Ate One. Let’s Talk. The corner of the bag was the first spot to soak through with grease. Next, the table where we shot the photo began to glisten as I slid the dense circles around. My fingers came away slick within seconds of touching the cinnamon-sugar dusted rounds. Welcome to a many napkin affair. 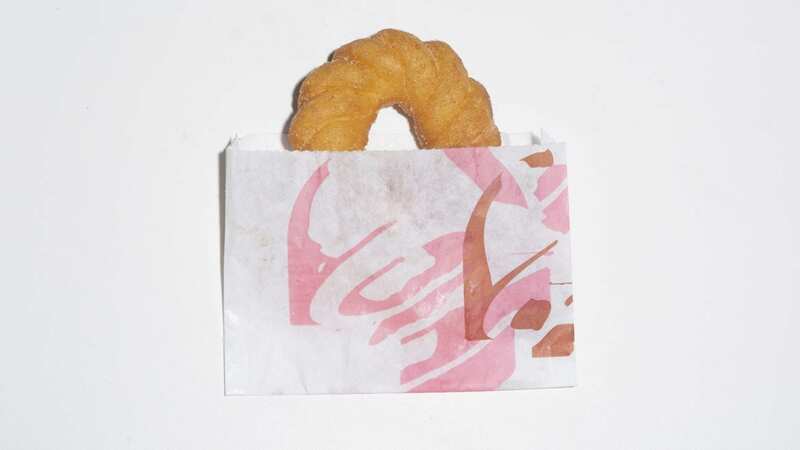 This is the Churro Donut from Taco Bell, which has more oil than a zit cream ad. The latest entry in the donut wars — McDonald’s dropped donut sticks in February and Dunkin’ Donuts donut fries dipped into last summer — is currently being tested in Kansas City, Missouri. In what may be devastating news to some, it did fill the slot on the menu (at least at the local Linwood location) most recently held by nacho fries. The churronut (that’s what we’re calling it from now on, just as they did on season three of “The Fosters”) gets its taste testing five years after Taco Bell unveiled a Sriracha menu in Kansas City. Middle America’s Venn diagram for fast food is starting to look fascinating. This churronut was vexing. It tore apart with the flaky promise of a crunch. Hey, we’re looking at a croissant mash-up here, maybe… but the interior had the pillowy interior of a doughy, mozzarella stick. You don’t chew the donut, so much as wince as it falls apart in your mouth. There was a light hint of cinnamon and faint echo of sugar, but the bland chewy insides robbed the churronut of punch. This was improved slightly when I squished a bite of donut between my fingers before eating. It was like messing with the ratio of Oreo creme to cookie. The compressed dessert from the breakfast menu had less surface area to overwhelm the cinnamon and sugar. It was very nearly crunchy too. The churronut lost something in fusion. The crispness of a churro was missing as was the moist delight of donuts. Multimedia arts producer Brad Austin labelled it “an undercooked funnel cake,” and that got at the heart of it. It was warm and soft in the manner of a microwavable burrito that has drowned in its own moisture (or in this case oil). Still, it’s $1. The novelty factor alone means that most folks that hit the drive-thru will try the Churro Donut. It is no less disappointing then losing a dollar in the vending machine.